When you get the Law of Attraction working for you, you feel like the luckiest person in the world. The Law of Attraction becomes your little helper, assisting you in getting all the good stuff in life. I know because I've used it to achieve success in many areas of my life in a short period of time. And most of successful people are using it, whether they know it or not – from Miley Cyrus to Kim Kardashian. Even Will Smith, Oprah and Jim Carrey have spoken publicly about their use of the Law of Attraction. Now, you may be wondering if there are any simple strategies that will make the Law of Attraction work for you. How can you get the Law of Attraction working to help you reach your life goals and be happier? And the most amazing part is that the Law of Attraction works even if you don't believe it. As long as you accept that how you think can affect the actions you take, then it doesn't matter if you believe the Law of Attraction is the best thing since sliced bread or just a bunch of mumbo jumbo. It doesn't matter if you ever saw The Secret. It doesn't matter if you never even heard of the Law of Attraction before today. None of those are essential to making the Law of Attraction work. 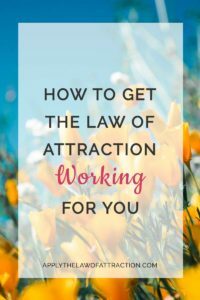 Here are some tips on how to get the Law of Attraction working for you, no matter what your life is like now. That's normal! It's often so much easier to know what you don't want than what you do want. After all, you usually pass your time thinking about the things you don't want. It could be a dead-end job, bill collectors calling, extra weight, lack of a relationship, or teenage children who seem unhappy no matter what you do. But the problem is that you create what you focus on. The more you think about something, the more of it you attract to you. And the more emotion you put into it, the faster it will come. So if you spend your time focusing on the things you don't like about your life with strong negative emotion (such as hatred and anger), you're drawing more of what you dislike to you. Instead think about what you do want in life. If you aren't sure what that is, look at the things you dislike in your life right now. Write them down on a piece of paper. Now go back over each one and write the opposite. This is what you do want. For example, if you dislike your dead-end job, you may want to change it to an amazing career you have where you're quickly climbing the ranks of the corporate ladder. I discussed a bit about how strong negative emotion creates. If you want to get the Law of Attraction working for you, you're going to need to focus on feeling happy and positive – about what you want to create and about your life in general. You can also express gratitude for what you already have in life – the people and things around you – as well as gratitude for how wonderful you know your life will be when your goal manifests. Now, you may be wondering how you're supposed to feel good or express gratitude when you're short on time, absolutely miserable and struggling to make it through the day. The truth is it's always possible. How much time are you spending worrying, rehearsing events, or thinking things will never change? Those are the moments to focus on feeling good and showing appreciation. It's the time when you're stuck in traffic on your morning commute or when you're doing your weekly shopping. It's those last few minutes before you fall asleep at night. It's when you're brushing your teeth or changing your clothes. Begin to spend that time focusing on how much better your life is becoming. Feel grateful for being able to wake up each day. Find a moment here and there to cultivate your garden of internal happiness. Before you know it, your days will get easier and your life will start to change. One of the reasons many people have trouble making the Law of Attraction work is that they think they can just pass their days visualizing what they want and it will fall into their lap, without their ever having to lift a finger. You still have to take action towards your goals. The good news is that once you have the Law of Attraction working for you, the action is pretty easy. Once you get clear on what you want and start thinking and feeling more positively, things will being to open up for you. Much of the effort required for you to succeed will be done. It really is much more simple to make things happen when using the Law of Attraction than when you to try to do everything yourself. Someone you meet at a coffee shop might reveal he's the perfect person to help you get your art show started. You might unexpectedly go shopping one day and find that a bookcase that perfectly suits your needs is marked down for unbelievable savings. A neighbor might decide to clean out her closet and let you take your pick – including unworn items still brand new with the price tags on them. When you see something or someone that might help you reach your goals, go after it. Don't hesitate. Take action and see what happens. You might need to take another action afterwards, maybe even a third, but you'll be well on your way to creating your dreams. Yet, at the same time, just being willing to do whatever it takes to make your dream come true often causes doors to open and things to happen magically. Sometimes being willing to do the work is all you need. Taking inspired action is so important, as you stated, we can dream all we want but until we move in the direction of those dreams, having any of our wants come to us will take more time. I like to write down what I’m, right now in the moment to see if the relationship between my feeling and what I want to happen are consistent with one another. If, for example, you want to make a greater income BUT you are focusing on how are you going to afford the next car payment, then your thoughts and feeling are out of alignment and thus your opportunity to make a more money will be slowed. We all can choose our thoughts, and the thoughts that are in line with what we want will carry us forward to take the action steps we need to get us closer to our desired outcome. Great tip for making sure your thoughts are aligned with your desires, Frank. Thanks for sharing it! Great Article! Thanks A Lot! So far…I’m trying detachment and positve thinking. What more tips do you suggest? – Manifesting Love, by Elizabeth Daniels – this blog’s author. If you ever wanted to use LOA to attract love, get an ex back and so on, get this book. I wish there was a hardcover copy of this so I could carry it all the time (the same way I do with Goddard’s Five Lessons. 🙂 I really love the way this book makes me feel and the way she presents the teachings. Thanks again, Elizabeth. You’re welcome Lil! I’m very flattered that you included my book with Neville’s books. I was wondering, how can a person think in a more positive way daily and stay away from negative thoughts. I think that is one of my biggest problems during the manifestation process. Also, I heard that manifestation can take about 30 days but how can one not grow impatient or doubtful during the processes? I grew up in a household that thrived on negativity. It has been very difficult for me to change my thought pattern as an adult. Any additional advice to a novice trying to apply the law of attraction, when I have had a long history of negative thoughts. Thanks for this website – I need the positive reinforcement. I have a laundry list of things I need to attract into my life. Hello Eliz. 🙂 Its quite glad to hear that we can control our lives! And its surprising too after always having heard about things like fate and destiny! But I am finding it difficult to believe. Would you please share some tips about how I can believe it easily. And I have also thought about manifesting and I am trying to EARN 100 bucks for a start ( you know a small amount is easiet to believe 😉 but still I can’t think of any ways as I am just 14. Will you please put some light on that too?! How can I really manifest this money?